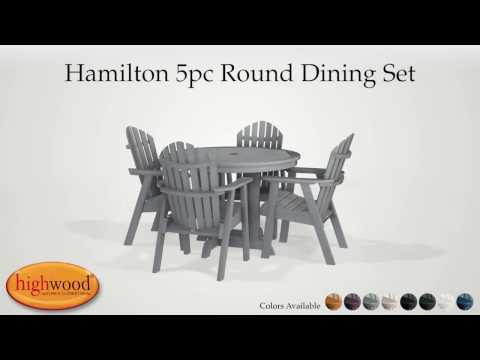 This Hamilton Dining Set features our classic 48in x 48in round dining table with an umbrella hole and 4x deck chairs for a matching set that will serve as an impressive focal point for your outdoor dining area. The Hamilton Collection's traditional Adirondack styling provides a beautiful surround in the chairs to our sturdy and well-built table. In addition to dining in style, our material is friendly to dirt and grime so clean up is a breeze. Dining separates can also be purchased to expand your set further. The chairs have been load-tested, per ASTM 1561-03 (2008) standard for Outdoor plastic furniture and have a 500-pound weight capacity. Assembly is required (see assembly guide). Please note that this is a larger item that ships LTL.